Liberal Democats leader Tim Farron has banned former Bradford MP David Ward from standing as a candidate in June's general election. The new Lib Dem leader has defended his predecessor Nick Clegg, who's been criticised for disappearing from the public eye. Speaking at the party conference, Tim Farron said the Sheffield Hallam MP had been ''supremely helpful' to him. Mr Farron told our Political Correspondent Paul Brand it was only normal for a leader to take time out after standing down. Nick Clegg was offered a post in the new Lib Dem 'front bench' line up but declined and decided to stay on back benches. Sheffield Hallam MP Nick Clegg is set to give his first interview following the general election. The LBC interview will take place as ballots are distributed to party members tasked with electing his replacement. Mr Clegg stepped down as Liberal Democrat leader after his party ended up with just eight seats, falling from the more than fifty they had won in 2010. The Archbishop of York, Dr John Sentamu, has paid tribute to former leader of the Liberal Democrats Charles Kennedy. Mr Kennedy died at the age of 55 this morning. Charles Kennedy reminded us of the continuing importance of being able to rely on a body of principle by which our plans and actions can be both motivated and judged. This body of principle and his determination to uphold the Rule of Law, both at home and internationally, gave great encouragement to many of us who opposed the Iraq war. Describing himself as a ‘wee crofter’ hid a steeliness of a man who led and inspired others by his sheer humanity. Love and prayers to all his family. May Charles Kennedy Rest in Peace and Rise in Glory. Tim Farron will officially announce his candidacy to replace Sheffield Hallam MP Nick Clegg as Leader of the Liberal Democrats when he visits Otley today. The local Leeds North West MP Greg Mullholland will be the Westmorland and Lonsdale MP's campaign co-ordinator. Farron served four years as President of the Liberal Democrats, until December 2014, and is hugely popular among party grassroots. “That over 10,000 people have joined the party since polling day shows we still have huge appeal among voters. "I have every confidence that we as a party can rebuild after a difficult general election - I want to be at the forefront of that, and that’s why I am running to be Leader of the Liberal Democrats. “I am greatly looking forward to visiting Otley to announce my candidacy. It’s a great example of an area where people see us as the party with the right priorities and are ready to back us. “I am delighted to be backing Tim Farron to be the next leader of the Liberal Democrats. We need to re-establish a strong identity for the party and reconnect and re-engage with the public. "Tim has a clear vision for how the party can be energised to do just that and I want to be part of that vision and making it happen. “I am very pleased that Tim agreed to come to Otley to launch his leadership campaign. Otley is a proud liberal town, with strong civic pride and a wonderful community spirit. "It is great that after the remarkable Liberal Democrat victory in the Otley Town Council elections, Tim is launching the Liberal Democrat fightback – and we want Otley to be an example of how a strong liberal team can deliver for people. “Tim has the ability to connect with people from all different backgrounds, in all different parts of this country and he is the right person to lead the liberal revival this country needs. " Nick Clegg has announced his resignation as leader of the Liberal Democrats. It is simply been heartbreaking to see so many friends and colleagues who have served their constituents so diligently, over so many years, abruptly lose their seats because of forces entirely beyond their control. I always expected this election to be exceptionally difficult for the Liberal Democrats given the heavy responsibilities we have had to bear in government in the most challenging of circumstances. But clearly the results have been immeasurably more crushing and unkind than I could ever have feared. For that, of course, I must take responsibility. Nick Clegg says he will speak to his party later today about what has been a "cruel and punishing night" for the Liberal Democrats. The Lib Dems are loosing MPs left, right and centre. Vince Cable, Ed Davey, Jo Swinson and Simon Hughes have all been voted out and Clegg is rumoured to be looking vulnerable. Even the bastion of Eastleigh is wobbling. Elsewhere their vote is collapsing. The party kept all their deposits in 2010 (you loose £500 if you fail to get 5%of the vote), but they have lost thousands of pounds worth already this time round. Ahead of tonight it was predicted that Lib Dem support would fracture in different directions with Labour, the Conservatives and SNP picking up seats from the Party. What is striking, however, is the number of seats falling to the Conservatives. 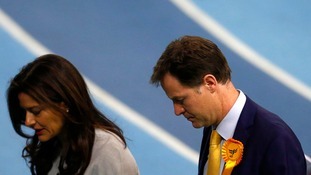 When Clegg entered into coalition it seemed that the partnership was more than a formal arrangement. Cameron and Clegg looked incredibly comfortable together and in the early days of government a cohesive partnership formed. But as the election approached the relationship became acrimonious to say the least. What friendship was there in 2010 now seems to be long gone, especially as the Conservatives are taking seat after seat from the Liberal Democrats. Being in coalition, it seems, does not win you any special treatment from your coalition partner.